Our custom clips are made from rugged .125 kydex. Easy on and off the belt or thread it through like a normal belt loop. Also the clip can clip to draw string style shorts or pants. 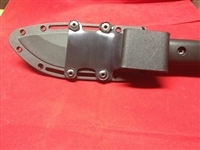 Your currently viewing our Custom Hand made Kabar BK2 And BK3 Kydex Clips. Our custom BK Clip is a direct bold on replacement of the factory nylon belt loop. The BK Clip changes the whole sheath up it moves the knife onto the hip and it keeps it securely there! No more swinging flopping sheath on your hip ! Our custom drop plate for the esee 5 factory sheath. The plate drops the whole sheath down so the handle of the knife is on your belt line. Made of rugged .125 kydex and is fitted with a tek-lok clip and hardware.